Kelly Richardson is a Canadian artist, living and working in North East England. Her work is currently the subject of a 15 year retrospective at the Towner (Eastbourne, UK) and Albright-Knox Art Gallery (Buffalo, USA). Richardson has been widely acclaimed in North America, Asia and Europe, having been selected for the Beijing, Gwangju and Busan biennales, and major moving image exhibitions including theThe Cinema Effect: Illusion, Reality and the Moving Image at the Hirshhorn Museum and Sculpture Garden (Washington, USA) and Caixaforum (Barcelona, Spain) and Videosphere: A New Generation at the Albright-Knox Art Gallery (Buffalo, USA). Her video installations have been included in the Toronto International Film Festival (2012) and Sundance Film Festival (2011 and 2009) and in 2009, she was honoured as the featured artist at the Americans for the Arts National Arts Awards. Richardson's work has been acquired by major museums across the USA and Canada, from the Hirshhorn Museum and Sculpture Garden and Albright-Knox Art Gallery to the Musée d'art contemporain de Montréal and Art Gallery of Ontario. In the following interview, Richardson reflects on the background and inspiration to her works on show at her current exhibition at Towner, as well as her solo exhibition at Edel Assanti, in London. 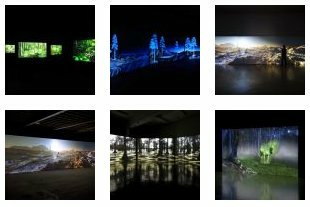 Christiane Monarchi: Your current exhibition 'Legion' at Towner includes incredibly detailed digital projections of what can only be described as otherworldly environments . Yet we understand that these landscapes include both fact and science fiction in their creation. What has been the starting point for you in creating these installations, for example, the ethereal landscape with glowing trees of 'The Erudition'? Kelly Richardson: The starting point for all of the work is always the idea for each. In most cases, I then source, visit and shoot existing landscapes which I combine with digital effects to create the photographs and video installations. The visual effects themselves take an extraordinary amount of time to research and develop for each idea. For 'The Erudition', onto an otherworldly landscape I wanted to create a large, slightly malfunctioning, holographic forest or the impression that it might have been if fully functioning. The landscapes were shot in Dinosaur Provincial Park in Southern Alberta during a residency with the Southern Alberta Art Gallery and then highly manipulated to control the colour, light, mood and importantly to the idea, to remove all signs of humanity. Months were then dedicated to learning two new software programs to create the holopads and holographic trees which appeared to be blowing in a fictional wind. All of the individual components which make up the images were then composited together to produce the final works. From start to finish 'The Erudition' took about a year and a half to see to completion. CM: In fact you have mentioned dealings with JPL (Jet Propulsion Laboratory) to create 'Mariner 9′, a bit out of the normal trajectory for a lens-based artist. How did your artistic enquiry lead to a scientific one, and how have you combined the two? KR: I have a set of interests which I tend to combine in most works, one of which is our digital age where within a vast sea of 1s and 0s truth is difficult if not impossible to locate. To a certain extent, I've tried to combine both real and constructed imagery which alludes to this. Usually I begin by filming existing landscapes but in the case of 'Mariner 9′, with the idea set on Mars, that was impossible. I could have faked it by filming in Arizona for instance but I then discovered that NASA knows how Mars is constructed and had released that data to the public which in theory, could then be brought into a terrain generating software package (which I had never used) to create the lay of the land faithfully. So, that is what I endeavoured to do. Once again, this required months of research and development into transcoding the data into a readable format by the software and learning for the first time, how to create a photo realistic terrain from scratch essentially as once the lay of the land was imported, I then had to create dirt, rocks similar to those on Mars, dust, etc. I guess it became a bit of an obsession to represent a future Mars as faithfully as possible, to create a believable landscape which the viewer could imagine themselves within, as though they could step through the projection onto the planet. To achieve this, I worked with scientific data and findings released by NASA, HiRISE at the University of Arizona and The Planetary Society. I was also in touch with the lead animator at JPL who is responsible for visualising NASA's missions to the planet to get his feedback on the accuracy of the image. The landscape is also littered with the partially functioning, rusting remains from various missions to the planet - both actual and imagined to create a kind of ruin of space exploration. As above, a great deal of research and development was dedicated to reproducing digitally, aged versions of some of the spacecraft which successfully landed on Mars, along with research into current technological developments to create a future rover for the scene. Artistic liberties have certainly been taken with 'Mariner 9′, just as with other work, but that interest in blending fact and fiction remains even if the entirety of the piece has been created in the studio. CM: What colour is Mars? How big are the rocks? How did you ge a realistic rendering of Mariner? And perhaps unifying all of these queries, is it important to you to 'get it right'? KR: I used images released from NASA as reference to produce the colour of my Mars, which is a kind of rust colour. As the sun is low, my image is a little more saturated and adjusted slightly to accommodate the cast of light and colour from a Martian sunset, which is the reverse of ours. On Mars, the colours of a sun set blend from cool to warm, with the cool blue hue immediately surrounding the sun. For the realistic rendering of Mariner 9 the spacecraft, it was created in a 3D modelling program using actual images of it as reference to the ensure its accuracy. CM: Could you tell a lay person what happens on a 'render farm' ? KR: To create digital effects to a high standard, serious computer power is needed which can take many hours, days and in my case, months just for the render process. In the film industry, render farms are used to speed up render times. Effectively, they are made up of networked computers all sharing the intensive digital workload to produce effects much more quickly. CM:This may be first and last time on Photomonitor I get to ask this in the normal course of an interview, so here goes - what are rocket scientists like? What do they make of your artistic rendering of their cold hard data? KR: I'm not sure about rocket scientists exactly but I would love to know. However, I've had very positive responses from other professionals in the field, including the lead animator at NASA who was so impressed with the landscape that it inspired him to go back into the program that I was using, Terragen, to try to get to grips with it. CM: With your early practice grounded in several media including painting and drawing, have you drawn inspiration from historical genres such as landscape painting? KR: Yes, over the last few years I've been particularly interested in the Apocalyptic Sublime and the painters of that era. I do find their work inspiring, particularly in their ability to elicit affect but I'm also interested in the events politically and culturally which originally inspired their work and why it resonated so well with the public at the time. Over the last 15 years or so, we've seen a return of sublime, apocalyptic imagery not within art, but within cinema - unprecedented within its history with over 60 films depicting end of world story lines produced. I'm particularly interested in this return and its successful reception with the public. In both cases, I believe such imagery resonated and resonates with anxiety felt from the public at large about an uncertain future due to enormous environmental, cultural, societal shifts. In the first instance, it was likely due to the threat of war and (most importantly to my work) the birth of the Industrial Revolution. We are now sitting on the other side, with a vastly and gravely altered planet, facing its effects. With terrifying predictions of the future from the world's leading scientists and with extreme weather conditions from climate change already evident, it's no wonder why such apocalyptic imagery resonates with the public once again. CM: Your present works contain movement, but no narrative trajectory per se, and they feel like an exploration of duration and dream. Have you experienced with what is the right balance between still life and a moving image for the viewer to achieve this sensation? KR: I like to think of them as collapsed narratives. I present scenes with a kind of calculated ambiguity, offering numerous ways to read the work, each of which taps into a set of interests that I have. They operate like moving photographs. The pace, like actual landscapes, similar to watching a sun set or ocean waves. I'm trying to create contemplative places which are both beautiful and mesmeric but at the same time, unsettling. CM: How do your viewers interact with your large multichannel projections/surround sound projections? KR: On a number of occasions now, I've witnessed large groups of people sat quietly, contemplating the work for extended periods of time which is unusual interaction for most gallery exhibitions. I think I've only witnessed it once before. Where photography is allowed (I always allow it but some museums and galleries don't), I've also watched the entirety of the near 50 foot landscapes become completely obscured with people taking photographs of themselves in front of it. Interestingly in both instances, in the real world like interaction from the public can be found in front of beautiful vistas within some of the worlds remaining, untouched landscapes preserved within national parks. CM: While entrancing the viewer with hyper-real visual landscape, 'Mariner 9′ can also carry other readings, especially when examining the mass of space debris on the scene, some robotic modules still twitching with their programmed intent to analyse and transmit. What inspired you to fast forward to this time, several hundred years into the future? KR: 200 or 300 years ago it would have been impossible to imagine what kind of world we'd be living in. To some extent, that's still true but we've also never faced a future which on our current path promises unthinkable environmental disaster. 'Mariner 9′ depicts a future Mars littered with spacecraft, deployed ultimately with the intention of finding signs of life. That search for life, to know that we're not alone in the universe is a beautiful endeavour but it's also an amazing contradiction with regards to the value we place on life we know to exist on our own planet, which we are destroying at a terrifying rate. Visualising a potential future, making it in some way tangible, may be the only window through we can truly appreciate who we are now, where our priorities lie and where we are heading. CM: Where are the people in your current works? KR: There are no people in my work as I want viewers to see/insert themselves into the landscapes. They are the main characters. CM: You have mentioned in discussing your work, that 'it has never been a more important time to look into the future' and indeed we have gotten several glimpses in this exhibition. What does the future hold for us on our planet? CM: What does the future hold for you? Where will your ideas take you next? KR: That's a good question. As I'm in the middle of staging a mid-career retrospective, it's been a useful time to look back on the work as a whole and assess where I may take things in the next few years. At the moment I'm working on a new body of photographs and a major new video installation entitled 'The Last Frontier' which will consist of 5 channels depicting enormous electrical looking, stormy domes in various parts of the globe. They look a little like explosions but as they are neither increasing or decreasing in size a number of other implied narratives could offer explanation.